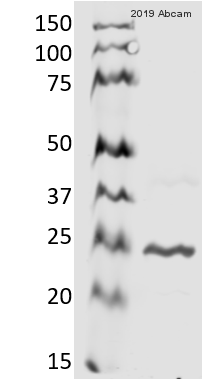 Full length protein corresponding to Aequorea victoria GFP aa 1 to the C-terminus. WB: GFP transfected 293 cell lysate. IHC-P: GFP transgenic mouse colon tissue and GFP transgenic mouse liver tissue. ICC/IF: GFP transfected 293 cells. ICC-IF: GFP transfected NIH3T3 cells. On the basis of low sequence homology, ab183734 is predicted to show no or limited cross-reactivity to RFP, BFP, and CFP. For the best results in IHC, please use ab183734 on Formalin/PFA-fixed paraffin-embedded sections with heat mediated antigen retrieval. Our Abpromise guarantee covers the use of ab183734 in the following tested applications. WB 1/10000 - 1/50000. 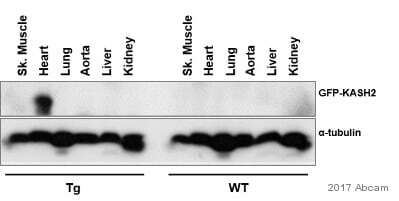 Detects a band of approximately 27 kDa (predicted molecular weight: 27 kDa). 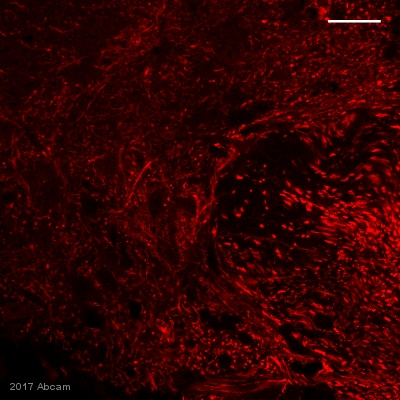 Immunohistochemistry (Formalin/PFA-fixed paraffin-embedded sections) analysis of GFP transgenic mouse pancreas tissue labelling GFP with purified ab183734 at a dilution of 1/100. Heat mediated antigen retrieval was performed using Tris/EDTA buffer pH 9. ab97051, a HRP-conjugated goat anti-rabbit IgG (H+L) was used as the secondary antibody (1/500). Negative control using PBS instead of primary antibody. Counterstained with hematoxylin. ab183734 staining GFP in GFP-transfected NIH3T3 cells. The cells were fixed with 4% formaldehyde (10min) and then blocked in 1% BSA / 0.3M glycine in 0.1%PBS-Tween for 1h. The cells were then incubated with ab183734 at 1/500 dilution overnight at +4°C followed by incubation with ab150081, Goat Anti-Rabbit IgG H&L (Alexa Fluor® 488), for 1 hour, at 1μg/ml. Under identical experimental conditions, when compared to the basal level of GFP expression in transfected NIH3T3 cells, the cells upon which ab183734 was applied gave a stronger signal in the 488 channel, indicating that ab183734 is binding to GFP and therefore eliciting signal amplification. 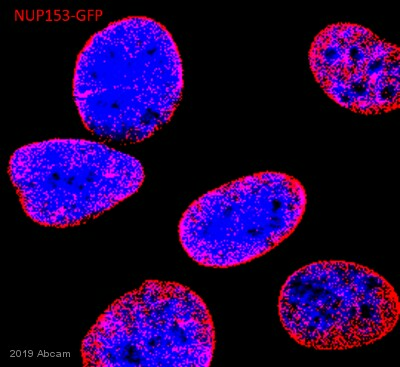 ab183734 was also applied to non-GFP-transfected NIH3T3 cells, which produced no positive staining, indicating specificity for GFP. Nuclear DNA was labelled with 1.43μM DAPI (blue). Flow Cytometry analysis of 293T (human embryonic kidney) transfected with human TNFRSF9 cells labeling GFP with purified ab183734 at 1/50 dilution(10ug/ml) (red). Cells were fixed with 4% paraformaldehyde and permeabilised with 90% methanol. A Goat anti rabbit IgG (Alexa Fluor® 647)(1/2000 dilution) was used as the secondary antibody. Rabbit monoclonal IgG (Black) was used as the isotype control, cells without incubation with primary antibody and secondary antibody (Blue) was used as the unlabeled control. Immunohistochemical analysis of paraffin-embedded GFP transgenic mouse colon tissue (left) and normal mouse colon tissue (right) labeling GFP with unpurified ab183734 at 1/250 dilution followed by prediluted HRP Polymer for Rabbit IgG. Counterstained with Hematoxylin. 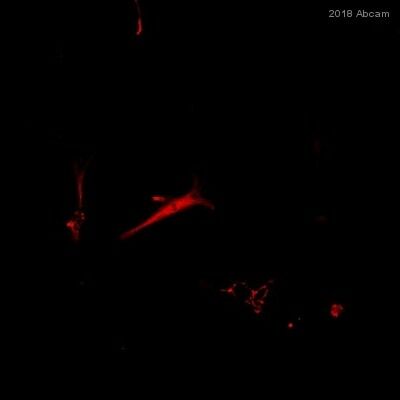 Immunohistochemistry (Formalin/PFA-fixed paraffin-embedded sections) analysis of mouse pancreas tissue (negative control) labelling GFP with purified ab183734 at a dilution of 1/100. 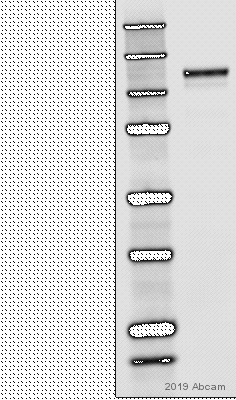 Heat mediated antigen retrieval was performed using Tris/EDTA buffer pH 9. ab97051, a HRP-conjugated goat anti-rabbit IgG (H+L) was used as the secondary antibody (1/500). Negative control using PBS instead of primary antibody. Counterstained with hematoxylin. Immunohistochemical analysis of paraffin-embedded GFP transgenic mouse liver tissue (left) and normal mouse liver tissue (right) labeling GFP with unpurified ab183734 at 1/250 dilution followed by prediluted HRP Polymer for Rabbit IgG. Counterstained with Hematoxylin.